2018 No. 6 1 2018 EASTERN BIOLOGIST 6:1–21 MFP1 Affects Relative Abundance of Chloroplast Protein Complexes Amanda R. Havighorst1 and Annkatrin Rose2* Astract – Matrix Attachment Region-Binding Filament-Like Protein 1 (MFP1) is an integral thylakoid membrane protein conserved in land plant chloroplasts. Here we investigate its function in Arabidopsis thaliana on cellular, molecular and physiological levels. Immuno-detection shows its presence as a dimer and in higher molecular weight complexes of chloroplasts. Blue native polyacrylamide gel electrophoresis indicates that the relative abundance of chloroplast complexes is altered in MFP1 knock-out mutants. These results demonstrate that while MFP1 does not appear to contribute to the stacking of thylakoid membranes or affect photosynthetic efficiency under standard growth conditions, it associates with and affects higher molecular mass protein complexes in the chloroplast. This suggests a role of MFP1 in the assembly or disassembly of these complexes during thylakoid remodeling. Introduction Matrix attachment region-binding filament-like protein 1 (MFP1) is a long coiled-coil protein found in the thylakoid membranes and nucleoids of plant chloroplasts (Jeong et al. 2003). It was originally isolated due to its ability to bind DNA and later confirmed to have strong non-specific DNA binding activity in Arabidopsis thaliana chloroplasts (Meier et al. 1996, Jeong et al. 2003). Structurally, MFP1 resembles long coiled-coil proteins similar to intermediate filaments, such as the nuclear lamins, and membrane-associated proteins, such as golgins (Jeong et al. 2003). Proteins with extended coiled-coil domains are largely absent in prokaryotes, thus making MFP1 an intriguing candidate to study the role of a eukaryotic-type protein in an organelle derived from a prokaryotic endosymbiont (Rose et al. 2005). However, its function has remained largely enigmatic as despite its evolutionary conservation in plants, knock-out mutants lacking MFP1 protein show no visible phenotype under standard growth conditions (Jeong et al. 2003). MFP1 belongs to the growing list of nuclear encoded proteins with dual targeting mechanisms for the nucleus as well as plastids. It was originally predicted to be associated with the nuclear envelope, but was later found to contain a convincing nuclear localization signal in its C-terminus and a functional N-terminal chloroplast targeting peptide and thylakoid localization signal (Gindullis and Meier 1999, 1South Carolina College of Pharmacy, University of South Carolina, Columbia, SC 29208. 2Department of Biology, Appalachian State University, Boone, NC 28608. *Corresponding author – rosea@appstate.edu. Manuscript Editor: Tim Lindblom Eastern Biologist A.R. Havighorst and A. Rose 2018 No. 6 2 Jeong et al. 2003). Plastid proteomics studies have identified MFP1 in thylakoid and nucleoid-enriched fractions (Friso et al. 2004, Majeran et al. 2012, Peltier et al. 2004), and immunolocalization experiments with antisera against MFP1 confirmed its presence in both chloroplasts and the nuclear matrix (Samaniego et al. 2006a, Samaniego et al. 2008). Most proteins with a dual plastid/nuclear localization are involved in gene expression and associated with plastid DNA or RNA (Krause et al. 2012). In support of this hypothesis, MFP1 can be detected in transcriptionally active chromosome (TAC) fractions (Melonek et al. 2012). The association of MFP1 with DNA appears to occur without detectable sequence specificity and can be inhibited by phosphorylation (Jeong et al. 2004, Samaniego et al. 2006b). It has been suggested that MFP1 may play a role in anchoring the chloroplast DNA to the thylakoid membrane in mature chloroplasts, and the quantitative distribution of the protein observed in proteomics studies appears consistent with such a function (Majeran et al. 2012). However, no difference could be seen in the pattern of nucleoids associated with thylakoids between wild-type and MFP1 knock-out mutant plants (Jeong et al. 2003). In addition to its DNA binding activity residing in the C-terminal quarter, the defining feature of MFP1 is its coiled-coil domain spanning over 80% of the protein sequence and suggesting a long rod-like domain capable of forming filaments (Meier et al. 1996). Long coiled-coil domains play important roles in the organization of eukaryotic cells, including formation of cytoskeletal networks, structural maintenance of chromosomes and organization of the nuclear lamina, and organization and fusion of membranes (Rose and Meier 2004). The coiled-coil domain in MFP1 is preceded by a thylakoid targeting signal and transmembrane domain, which functions to anchor the protein in the thylakoid membrane in chloroplasts with the coiled-coil domain on the stroma side (Jeong et al. 2003). This topology of MFP1 in the thylakoid membranes resembles that of golgins at the Golgi apparatus, suggesting a possible role in membrane organization. The expression of MFP1 appears to be tightly correlated with the presence of thylakoid membranes. Gene expression and proteomics studies show that MFP1 begins to accumulate during the period of chloroplast development, while it drops off again with the transition from chloroplasts to chromoplasts (Barsan et al. 2012, Jeong et al. 2003). Likewise, MFP1 expression is highest when light is present and in the shoots of the plant, where photosynthesis occurs; it is lowest in the dark and in non-photosynthetic tissues (Jeong et al. 2003). One defining characteristic of the thylakoids of vascular plants is the formation of grana stacks during chloroplast development. These have been proposed to be an adaptation to growing on land, particularly in shaded environments and under fluctuating light conditions, by optimizing light capture and photosynthetic capacity (Chow et al. 2005, Mullineaux 2005). The grana stacks are highly dynamic with stacks forming during the first few hours of the light period, but largely disintegrating again during the dark period (Pfeiffer and Krupinska 2005). The mechanism of the formation of grana stacks is not yet well understood and has Eastern Biologist A.R. Havighorst and A. Rose 2018 No. 6 3 been suggested to involve physicochemical forces and increased entropy in the surrounding stroma leading to spontaneous stacking in vitro (Chow et al. 2005, Kim et al. 2005). The stacking appears to be further controlled by electrostatic forces and the phosphorylation of photosystem II (Fristedt et al. 2010). The stacking process may also involve specific proteins. For example, it appears that trimeric light harvesting complex (LHC) II is needed for grana stacks to form properly (Cui et al. 2011). In the Golgi bodies, an organelle which represents a similarly stacked dynamic membrane structure, the cisternae are held together by golgins, which are long coiled-coil proteins forming proteinaceous bridges between the membranes (Barr and Short 2003, Short et al. 2005). Most of the MFP1 produced by the cell is located in the thylakoid membrane of the chloroplast with the coiled-coil domain on the stroma side (Jeong et al. 2003). This topology would seem optimal for a protein with a role in thylakoid stacking and led us to hypothesize that the protein may have a function in membrane stacking similar to that of the golgins. The objective of this study was to trace the evolutionary history of MFP1 and elucidate its function in the chloroplast. To investigate whether MFP1 is involved in thylakoid membrane stacking, A. thaliana wild-type and MFP1 knock-out mutants were observed using transmission electron microscopy to directly view the thylakoid membranes. 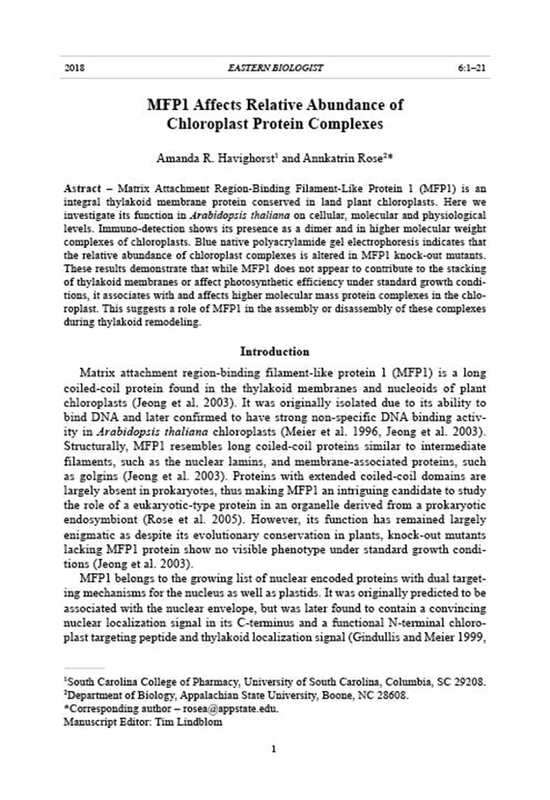 To test whether MFP1 is involved in protein-protein interactions, plants were then examined on the molecular scale using Blue-Native Polyacrylamide Gel Electrophoresis (BN-PAGE) to detect any differences in the presence and abundance of chloroplast protein complexes between wild-type and mutant plants and determine whether MFP1 associates with any such complexes. Finally, photosynthesis and chlorophyll measurements were used to test whether lack of MFP1 affected photosynthesis rates. Methods Sequence analysis Sequence similarity searches were performed using the blastp and tblastn algorithms and databases available at NCBI (http://www.ncbi.nlm.nih.gov/). For tblastn searches with protein sequence on nucleotide databases (WGS, whole-genome shotgun contigs; EST, expressed sequence tags; TSA, transcriptome shotgun assembly) to identify putative distant homologs, the scoring parameters were adjusted by changing the matrix to BLOSUM45 and searches limited to the organisms of interest. Pairwise alignments to verify sequence similarity were performed using the Smith-Waterman algorithm (http://www.ebi.ac.uk/Tools/psa/emboss_water/, Smith and Waterman 1981). Nucleotide sequences retrieved in searches were translated into amino acid sequences for protein domain analysis using the ExPASy Translate tool (http:// web.expasy.org/translate/). Domain and targeting predictions were performed using ChloroP for chloroplast targeting peptides (http://www.cbs.dtu.dk/services/ ChloroP/, Emanuelsson et al. 1999), TargetP for chloroplast, mitochondrial and Eastern Biologist A.R. Havighorst and A. Rose 2018 No. 6 4 secretory pathway targeting in plants (http://www.cbs.dtu.dk/services/TargetP/, Emanuelsson et al. 2007), PredAlgo for chloroplast and mitochondrial targeting in algae (http://giavap-genomes.ibpc.fr/predalgo/, Tardif et al. 2012), TatP for twin-arginine signal peptides (http://www.cbs.dtu.dk/services/TatP/, Bendtsen et al. 2005), PSORT for general targeting predictions (http://psort.hgc.jp/, Nakai and Horton 1999), TMHMM for transmembrane domains (http://www.cbs.dtu. dk/services/TMHMM/, Sonnhammer et al. 1998), and MultiCoil for coiled-coil domains (http://groups.csail.mit.edu/cb/multicoil/cgi-bin/multicoil.cgi, Wolf et al. 1997). Predicted targeting peptides were removed using cleavage site predictions before proceeding with the prediction of other domains in the protein sequences. Plants and growth conditions Plants used in this study included Arabidopsis thaliana (L.) Heynh. (Thale Cress) wild-type (WT) plants of Wassilewskija (Ws-2) ecotype and a previously described MFP1 knock-out mutant (KO) in Ws-2 background, which has a T-DNA insertion in the third intron and does not express MFP1 (Jeong et al. 2003). Seeds were planted on peat pellets (Jiffy brand, Plantation Products, Norton, MA, USA) or in MetroMix 360 (SunGro Horticulture, Agawam, MA, USA) and cold-stratified at 4°C for several days. Plants were grown under long-day (16 hours light at 23°C, 8 hours dark at 21°C) or short-day (8 hours light at 23°C, 16 hours dark at 21°C) conditions with an average light intensity of 200 μmol m-2 s-1 in a Percival Environmental Chamber E-30B (Percival Scientific Inc., Boone, IA , USA). DNA extraction and PCR analysis of genotype To verify genotypes, DNA was extracted from leaves and analyzed by PCR. Tissue samples were ground using a pellet pestle in a 1.5 mL centrifuge tube in 500 μL extraction buffer (0.2 M Tris-HCl, pH 9, 0.4 M LiCl, 25 mM EDTA, 1% SDS). After centrifuging for 5 minutes at 16,100 xg in a microcentrifuge (Eppendorf Centrifuge 5415 D, Eppendorf International, Hamburg, Germany), the supernatant was spun again and 400 μL of the cleared lysate was mixed with 400 μL of isopropanol to precipitate the DNA. After 10 minutes of centrifugation, the pellet was dried and resuspended in 100 μL of TE buffer. PCR was performed using 2 μL of DNA extract and Taq polymerase in a standard 50 μL PCR reaction using the primers MFP1-FP (5′-GGG CTT CTG TGT TCG ATG AAT GTC G-3′), MFP1-RP (5′-TTC TTA TGA GTT CTT CCT TCT GCT GTT TG-3′), and JL-202 (5′-CAT TTT ATA ATA ACG CTG CGG ACA TCT AC-3′). The PCR program consisted of an initial melt at 94°C for 5 minutes, followed by 30 cycles of 30 seconds at 94°C, 30 seconds at 58°C, and 2 minutes at 72°C, with a final extension step at 72°C for 5 minutes (using a GeneAmp PCR system 9700 thermocycler, Applied Biosystems, Carlsbad, CA, USA). For each DNA sample, two reactions were run, MFP1-FP + MFP-RP to amplify the wild-type allele, and JL-202 + MFP1-RP to amplify the T-DNA insertion allele, and analyzed on 1% agarose gels stained with ethidium bromide. Eastern Biologist A.R. Havighorst and A. Rose 2018 No. 6 5 Transmission electron microscopy Leaf samples from four-week-old plants were fixed in a 2.5% solution of glutaraldehyde (SPI Supplies, West Chester, PA, USA) in 1 mM sodium phosphate buffer (pH 6.7) for two weeks to ensure proper tissue infiltration. After fixation, the samples were washed twice for ten minutes with sodium phosphate buffer, stained for two hours using 1% osmium tetroxide (Ted Pella, Redding, CA, USA) in sodium phosphate buffer, washed twice for ten minutes and dehydrated in an ethanol gradient (successively, 50% ethanol for 2 hours, followed by 70%, 85%, and 90% ethanol for 1 hour and 15 minutes each, then in 100% ethanol overnight). Samples were removed from ethanol and soaked twice for seven minutes in propylene oxide (Electron Microscopy Sciences, Hatfield, PA, USA), and for one hour in a 1:1 mixture of propylene oxide and Spurr’s Low-Viscosity Resin (SPI Supplies). After allowing the propylene oxide to evaporate overnight, the old resin was removed and new resin added before embedding the leaf tissue in flat embedding molds (BEEM brand, Ted Pella) at 70°C for 14–15 hours. Once hardened, the resin-embedded samples were cut using a glass knife on a microtome (Ultracut E Ultramicrotome, Reichert-Jung, Depew, NY, USA) into 99 nm sections and placed on 3 mm copper grids. Samples were stained in a 1% uranyl acetate (Electron Microscopy Sciences) solution for five minutes, rinsed 10x in distilled water, stained for five minutes using lead citrate prepared fresh according to the protocol by Reynold (1963), and rinsed 10x in CO2-free distilled water in a container with pellets of sodium hydroxide to prevent the lead from precipitating. After drying the samples, they were examined under a JEM-1400 transmission electron microscope (JEOL Ltd., Peabody, MA, USA). Chloroplast isolation and protein extraction Chloroplast isolation was performed essentially as described previously (Kügler et al. 1997) starting with 2.5 g leaf tissue collected from 4-week-old plants. The chloroplasts were purified by gradient centrifugation using Percoll (Research Organics, Cleveland, OH, USA) and processed at 4°C for protein extraction immediately after isolation. Proteins were extracted from chloroplasts and BN-PAGE analysis performed according to a protocol modified from Kikuchi et al. (2011). The chloroplast pellet was resuspended in 160 μL solubilization buffer (50 mM Bis-Tris-HCl, pH 7; 0.5 M Aminocaproid Acid; 10% w/v Glycerol; 1% w/v watersoluble Digitonin (EMD Millipore, Darmstadt, Germany); 1% (v/v) protease inhibitor cocktail for plant extracts (Amresco, Solon, OH, USA)) and incubated for ten minutes. The solution was centrifuged for ten minutes at 16,100 xg and the supernatant transferred to new tubes in 80 μL aliquots. Each aliquot received 2 μL CBB-G solution (5% w/v Coomassie Brilliant Blue G-250, 50 mM Bis-Tris-HCl pH 7.0, 0.5 M Aminocaproic Acid) and was stored overnight at -20°C. Blue native polyacrylamide gel electrophoresis and immunoblotting Proteins were analyzed on a BN-PAGE mini gel with a gradient of 4% to 14% polyacrylamide, with a 3% stacking gel essentially as described previously (Kikuchi Eastern Biologist A.R. Havighorst and A. Rose 2018 No. 6 6 et al. 2011). The gel was poured using a gradient mixer (GM-100, C.B.S. Scientific Inc., Del Mar, CA, USA) and a peristaltic pump (Pump 60 RPM, VWR Int., Radnor, PA, USA) into a Bio-Rad 1.5 mm spacer gel plate for the Mini PROTEAN 3 system (Bio-Rad Laboratories, Inc., Hercules, CA, USA), overlaid with 100% isopropanol and allowed to polymerize before pouring the stacking gel. Gels were run at 4°C in a Mini-PROTEAN Tetra electrophoresis cell (Bio-Rad Laboratories) at 30 V for 30 minutes, and then raised to 80 V for 6 hours. Immediately after the run, the BN gel was photographed and lanes for 2-D analysis were then excised and denatured before being fitted into a preparative well in SDS-PAGE gels (1.5 mm, 12% running gel, 4% stacking gel). Any gaps were sealed using a low-melting agarose sealing buffer (0.5% w/v agarose, 25 mM Tris, 192 mM glycine, 0.1% w/v SDS). SDS-PAGE in Tris-glycine buffer and immunoblotting were performed essentially as described (Sambrook et al. 1989) using the Mini-PROTEAN electrophoresis and Trans-Blot system. Proteins were blotted onto PVDF membrane (Pall Life Sciences, Port Washington, NY, USA) and detected using a 1:5,000 dilution of MFP1 antibody OSU91 (Jeong et al. 2003) and a 1:10,000 dilution of Anti-Rabbit IgG (Sigma-Aldrich Co., St. Louis, MO, USA) followed by ECL detection on X-Ray film (Blue Ultra Autorad Film, GeneMate, BioExpress, Kaysville, UT, USA) for 15–20 minutes. The exposed film was developed using an X-Ray developer machine (SRX-101A, Konica Minolta, Ramsey, NJ, USA). Photosynthesis measurements and chlorophyll count For photosynthesis measurements, two-week old plants grown in MetroMix 360 were transferred to Ray Leach Cone-tainers (model SC-7, Stuewe and Sons Inc., Tangent, OR, USA) and the soil surface sealed with white soft modeling clay (Sculpey Pluffy brand, Polyform Products Company, Elk Grove Village, IL, USA). Plants were allowed to rest for at least 12 hours before being fitted into the Whole Plant Arabidopsis Chamber for measurements using the RGB light source and LI-6400XT Portable Photosynthesis System (LI-COR, Lincoln, NE, USA). Conditions were set to match those in the growth chamber ([CO2] = 400 ppm, RH = 60–70%, temperature = 23°C), and photosynthesis-irradiance curves were recorded based on CO2 uptake per time and leaf area as photosynthetic photon flux density (PPFD) was decreased stepwise (1000, 750, 500, 300, 150, 100, 75, 50, 25, 0 μmol m-2 s-1). Leaf area was determined using a CanoScan 9000F Mark II scanner (Canon, Melville, NY, USA) and the Black Spot Leaf Area Calculator (http://www.ncbs.res. in/blackspot.html, Varma and Osuri 2013). To determine chlorophyll content on leaf area basis, all leaves measured from each plant were incubated in 3 mL N,N-Dimethylformamide (DMF) for ten days in the dark at 4°C to extract the pigments. Samples were diluted 1:10 in DMF and absorption at 470 nm, 647 nm, and 664 nm measured on a Genesys 20 spectrophotometer after setting the blank at 720 nm (Thermo Scientific, Waltham, MA, USA). Total pigment amounts were calculated as described previously (Porra et al. 1989). Eastern Biologist A.R. Havighorst and A. Rose 2018 No. 6 7 Subsequent statistical analysis was done in SigmaPlot 12.5 (Systat Software, San Jose, CA, USA) using a two-tailed T-test to calculate significance values. Results MFP1 is conserved and expressed in embryophytes MFP1 has been described as conserved among higher plants (Harder et al. 2000), and homologs of A. thaliana MFP1 can be identified with high confidence in a wide range of angiosperms through standard sequence similarity searches (Table 1). Recent advances in genome sequencing have opened up the opportunity to expand the search for homologs beyond the flowering plants. MFP1-like sequences can be found in the expressed sequence tags (EST) database in eight gymnosperm species representing all phyla (several conifers, Ginkgo biloba L., Cycas rumphii Miq., and Welwitschia mirabilis Hook. f.), as well as seedless plants including ferns (Adiantum capillus-veneris L. gametophyte), the lycophyte Selaginella moellendorffii Hieron., and the bryophyte Physcomitrella patens (Hedwig) Bruch and Schimper. The presence of genes coding for previously unknown MFP1 homologs in non-flowering plants was verified using a tblastn search with the basal angiosperm Amborella trichopoda Baill. sequence on wholegenome shotgun contigs (WGS database). This search confirmed with high confidence DNA sequences coding for full length MFP1 homologs in several recently sequenced conifer genomes, a putative homolog in the seedless vascular plant S. moellendorffii, and suggested the presence of a gene coding for an MFP1-like Table 1. Organisms with coding sequences for MFP1-like proteins identified in BLAST sequence searches and included in the domain analysis in Figure 1. Organism Sequences Identity Query coverage E-value Search* Eudicots Multiple (28) 38-100% 79-100% < 10-100 A Amborella XP_006844348.1 37% 94% 3e-106 A Monocots Multiple (10) 33-37% 73-100% < 10-70 A Conifers Multiple (3) 34-35% 78-94% < 10-65 B Selaginella ADFJ01000391.1 25% 67% 2e-12 B Physcomitrella ABEU01011440.1 25% 31% 25% 37% 6e-05 2e-14 B C Klebsormidium BANV01000989.1 44% 23% 0.001 D *Searches included: (A) blastp query on nr database using NP_188221.2 (Arabidopsis); (B) tblastn query on wgs database (excluding flowering plants) using XP_006844348.1 (Amborella); (C) tblastn query on WGS database (excluding flowering plants) using translated peptide from a predicted full-length sequence based on ADFJ01000391.1 and GENSCAN prediction (Selaginella, see Fig. S1; see supplemental File 1, available online at https:// eaglehill.us/ebioonline/suppl-files/ebio-006-rose-s1.pdf); (D) tblastn query on wgs database (excluding flowering plants) using translated peptide from a predicted full-length sequence based on ABEU01011440.1 and GENSCAN prediction (Physcomitrella, see Fig. S2). Eastern Biologist A.R. Havighorst and A. Rose 2018 No. 6 8 protein in the genome of P. patens (Table 1). All sequence similarities were supported by reverse searches. To confirm sequence similarities and potentially identify more distantly related sequences, EST data and GENSCAN gene predictions were combined to generate putative full-length MFP1 peptide sequence from S. moellendorffii and P. patens (Figs. S1 and S2; see Supplemental File 1, available online at https://eaglehill.us/ebioonline/suppl-files/ebio-006-rose-s1.pdf). The putative peptide translated from the P. patens sequence was used in blastp and tblastn searches on green algae and cyanobacterial sequences, including whole genome Figure 1. Conservation of MFP1 domain structure in plants. Homologs of MFP1 and putative MFP1-like proteins were identified through database searches and analyzed for predicted targeting, transmembrane, and coiled-coil domains represented by colored boxes. The following full length MFP1 sequences were retrieved from GenBank: Oryza sativa, NP_001042206.1; A. thaliana, NP_188221.2; Amborella trichopoda, XP_006844348.1; Pinus massoniana, GAQR01005672.1 (RNA, translated). The following putative full length sequences were constructed using partial ESTs and GENSCAN predictions and are available as supplementary material: S. moellendorffii, P. patens, and K. flaccidum (see Supplemental File 1, available online at https://eaglehill.us/ebioonline/suppl-files/ebio-006-rose-s1.pdf). Organisms are identified by their genus name in the figure, with the length of each protein listed in amino acids (aa). The dotted triangle in the S. moellendorffii sequence indicates a putative exon predicted in GENSCAN using Arabidopsis splicing models, but not with maize splicing models. Eastern Biologist A.R. Havighorst and A. Rose 2018 No. 6 9 shotgun assemblies, to query for the possible presence of MFP1-like sequences outside the embryophytes. These searches identified a short putative MFP1-like sequence from the terrestrial alga Klebsormidium flaccidum (Kuetz.) Silva et al. This sequence failed to pick up any plant MFP1 sequences outside of the mosses when used in a reverse search on whole genome shotgun sequences, but a more detailed analysis of its protein domains showed structural similarity to MFP1 (Figs. 1 and S3). Analysis of predicted targeting and structural domains on the identified or predicted full-length MFP1 and MFP1-like sequences demonstrates that the MFP1 domain structure is well conserved throughout the plant kingdom (Fig. 1). Similarities between the sequences selected for Figure 1 are summarized in Table 2. All angiosperm and gymnosperm sequences analyzed showed the pattern of a chloroplast targeting peptide followed by a twin-arginine (TAT pathway) thylakoid targeting peptide, a transmembrane domain, and a long coiled-coil domain. Seedless plants and bryophytes shared the coiled-coil domain with significant similarity scores to seed plants, but were more variable in their N-terminal domains. Specifically, while most of the non-seed plant sequences had a predicted chloroplast targeting peptide and a hydrophobic domain that could act as Table 2. Sequence similarities between full-length MFP1 and MFP1-like proteins. Pairwise sequence alignments were performed using the Smith-Waterman algorithm. Percent identity is given (with percent similarity in parenthesis) above the diagonal, and the length of the top scoring local alignment in amino acids (aa) below the diagonal. Rice A. thaliana A. trichopoda Pine S. moellendorffii P. patens K. flaccidum Rice 100% 766 aa 35.1% (71.5%) 35.5% (72.7%) 31.6% (68.8%) 22.8% (60.0%) 24.1% (66.2%) 22.4% (58.3%) A. thaliana 706 aa 100% 726 aa 37.2% (71.0%) 33.0% (66.8%) 24.0% (64.2%) 25.0% (59.8%) 21.6% (53.0%) A. trichopoda 670 aa 710 aa 100% 728 aa 34.4% (70.0%) 23.8% (64.8%) 21.6% (62.1%) 22.2% (57.2%) Pine 693 aa 702 aa 727 aa 100% 806 aa 26.6% (67.0%) 25.9% (61.6%) 22.4% (56.8%) S. moellendorffii 715 aa 682 aa 651 aa 730 aa 100% 805 aa 26.6% (64.0%) 24.1% (59.7%) P. patens 515 aa 564 aa 657 aa 560 aa 583 aa 100% 583 aa 29.8% (60.4%) K. flaccidum 633 aa 670 aa 540 aa 553 aa 444 aa 439 aa 100% 663 Eastern Biologist A.R. Havighorst and A. Rose 2018 No. 6 10 a transmembrane anchor, they failed to score positive for twin-arginine thylakoid targeting signals. The K. flaccidum sequence was predicted to contain a putative chloroplast targeting signal by ChloroP with a threshold score of 0.5, but failed to be predicted as a chloroplast protein in PredAlgo, a program trained to detect algae targeting signals. MFP1 knock-out mutants show a delay in bolting under short days To investigate the possible function of MFP1 using reverse genetics, wild-type A. thaliana plants and a knock-out mutant lacking MFP1 protein were examined for phenotypes. Under standard long-day conditions, plants grew at the same rate and bolted at the same time as wild-type, essentially showing no mutant phenotype as previously reported (Jeong et al. 2003). However, when grown under short-day photoperiod, plants repeatedly showed a slight difference in bolting time compared to wild-type (Fig. 2). Plants were analyzed by PCR to verify their genotypes. Grana stacks appear normal in the absence of MFP1 Based on the similarity of MFP1 structure and topology with golgins, the hypothesis was tested that MFP1 might be involved in membrane stacking events in the chloroplast similarly to golgins facilitating the stacking of the Golgi cisternae (Fig. 3A). Transmission electron microscopy was used to compare the thylakoid membranes in wild-type and mutant plants grown under short-day conditions for four weeks. However, electron micrographs of mutant chloroplasts showed no significant difference in the grana stacking compared to the wild-type; both had healthy, abundant grana stacks with no apparent abnormalities (Fig. 3B–C). The number of grana stacks and the number of layers present per grana stack were counted in a limited number of chloroplast sections. A “grana stack” was considered a section of thylakoid membrane containing three or more layers; sections with two or fewer layers were not counted. The knock-out mutant was found to contain a slightly greater number of grana stacks (23.5 stacks/chloroplast, n = 2) than the wild-type (20 stacks/chloroplast, n = 3), but the grana stacks in the mutant had fewer layers (3.73 layers/granum, n = 30) than did the stacks in the wild-type (4.41 layers/granum, n = 49). Lack of MFP1 is associated with changes in relative abundance of chloroplast protein complexes After rejecting the thylakoid stacking hypothesis, we investigated the possibility of MFP1 being involved in protein complex formation based on the fact that coiledcoil domains often serve as protein-protein interaction domains. Chloroplasts were isolated from wild-type and knock-out mutant plants grown under short-day conditions, solubilized with 1% digitonin, and analyzed using blue native polyacrylamide gel electrophoresis (BN-PAGE). A 1D BN-PAGE gel was used to compare the protein complexes present in the chloroplasts of both the wild-type and the mutant (Fig. 4A). Bands that appeared different in intensity between wild-type and Eastern Biologist A.R. Havighorst and A. Rose 2018 No. 6 11 Figure 3. MFP1 does not appear to be involved in thylakoid stacking. (A) Model of the stacking hypothesis of MFP1 function. The diagram on the left shows the topology of MFP1 as an integral thylakoid membrane protein with the transmembrane domain in yellow and coiled-coil domain in blue. The C-terminal domain of MFP1 binds to chloroplast DNA. The diagram on the right illustrates a possible mode of action for MFP1 being involved in thylakoid stacking via dimerization of its coiled-coil domains. Wild-type and mutant plants lacking MFP1 were subjected to transmission electron microscopy to test the stacking hypothesis. (B) TEM micrograph of thylakoid membranes from a wild-type plant. (C) TEM micrograph of thylakoid membranes from a knock-out mutant plant. Bars = 500 nm. No differences in thylakoid stacking were observed between wildtype and mutant. Plant genotypes were confirmed through PCR. Figure 2. MFP1 knock-out mutants bolt later than wild-type under certain conditions. (A) Wild-type Arabidopsis and a T-DNA insertion line lacking MFP1 were grown and observed for phenotypes under 200 μmol m-2 s-1 light intensity in a growth chamber. MFP1 mutants (left) show delayed bolting compared to wild-type (right) under long-day conditions in four-week old plants grown from seeds after six years of storage. This phenotype was only observed with old seeds, but partially reproducible under short-day conditions. (B) Fourweek old wild-type seedlings grown from recently harvested seeds under short-day conditions. (C) Four-week old MFP1 knock-out mutant plants grown under identical conditions alongside the wild-type plants in (B). Eastern Biologist A.R. Havighorst and A. Rose 2018 No. 6 12 mutant are marked with an asterisk. The putative identity of the observed bands was determined by comparing the banding pattern and apparent sizes of protein complexes with previously published BN-PAGE data of digitonin-solubilized A. thaliana chloroplast or thylakoid proteins (Heinemeyer et al. 2004, Järvi et al. 2011). Bands in the size range of 300–370 kDa corresponding to photosystem II monomers (PSII-M), cytochrome b6f, and possibly F1-ATP synthase and light-harvesting complex II (LHCII) on comparable gels, were just barely visible in the mutant when compared to the same bands in the wild-type. On the other hand, a band around 850 kDa, corresponding to the apparent molecular weight of the state-transitionspecific PSI-LHCII complex or a photosystem II supercomplex, appeared more intense in the mutant than in the wild-type. The apparent molecular mass of the LHCII trimer (LHCII-T) and the shape of the corresponding band differed between Figure 4. MFP1 is associated with protein complexes and affects the relative abundance of complexes in chloroplasts. Chloroplast protein extracts were solubilized with 1% digitonin and separated by BN-PAGE. (A) Coomassie staining of chloroplast proteins observed in gradient gel (BN-PAGE, left) and detection of MFP1 using immunoblotting (Western, right). The blue color of the BN-PAGE gel has been digitally removed using a blue filter for better contrast and visibility of bands. The gel picture and antibody signal have been lined up using the positions of the 440 and 880 kDa marker bands (Ferritin, 80 μg). Putative protein complexes corresponding to the visible bands were deduced from comparison of banding patterns with published data (Heinemeyer et al. 2004, Järvi et al. 2011). Cyt. b6f, cytochrome b6f; LHCI, light-harvesting complex I; LHCII, light-harvesting complex II; LHCII-T, light-harvesting complex II trimer; PSI, photosystem I; PSII-M, photosystem II monomer. Bands that show differential intensity in wild-type and mutant samples are highlighted by asterisks. WT, wild-type protein extract (20 μL); KO, knock-out mutant protein extract (20 μL). (B) Comparison of MFP1 detected by immunoblotting in wild-type samples separated in 1D BN-PAGE and the corresponding 2D SDS-PAGE. Marker sizes for the SDS-PAGE are indicated on the left. MFP1 signal is detected at the size of the mature protein (~75 kDa) and several smaller fragments. Eastern Biologist A.R. Havighorst and A. Rose 2018 No. 6 13 the wild-type and mutant, showing an “inverse smile” effect and lower molecular mass in the mutant sample (Fig. 4A). However, this effect did not occur if lower amounts of protein were loaded. To determine whether MFP1 might directly associate with chloroplast protein complexes, the protein was detected using immunoblotting with an antibody raised against the MFP1 coiled-coil domain (Fig. 4A, Western). The size of A. thaliana MFP1 protein in SDS-PAGE gels is around 75–80 kDa (Jeong et al. 2003, Samaniego et al. 2006a), however none of the protein was observed at that apparent size during BN-PAGE. On the 1D BN gel (Fig. 4A, WT Western), a strong MFP1 signal is detected in wild-type extracts between the bands corresponding to the apparent molecular size of LHCII trimer (~110 kDa) and cytochrome b6f/PSII-M (~300 kDa), with signal trailing to around 500 kDa. MFP1 signal also appeared above the 880 kDa marker position with a pronounced band in the range reported for PSI multimers and PSII-LHCII supercomplexes (Heinemeyer et al. 2004, Järvi et al. 2011). No signal was detected in mutant protein extracts, confirming the lack of MFP1 in the knock-out plants (Fig. 4A, KO Western). Strips of 1D BN gels containing wild-type protein were further separated by SDSPAGE and the resulting 2D gel subjected to an immunoblot with MFP1 antibody (Fig. 4B). The strongest signals were located around 75 kDa, which is the approximate size of the mature MFP1 protein after cleavage of the transit peptide, with several distinct smaller sizes around 50–55 kDa and approximately 27 and 10 kDa for the lowest mass complex. MFP1 signal in the higher molecular weight complexes mostly represented mature MFP1 with a secondary band around 50 kDa (Fig. 4B). Photosynthesis rates and chlorophyll content are not affected in MFP1 mutants To test whether MFP1 affects photosynthesis or pigment composition, we performed photosynthesis rate measurements on two-week old plants, as well as determined chlorophyll a, b, and carotenoid content of the leaves. However, no difference between wild-type and mutant plants could be found for either CO2 uptake (Fig. 5A) or chlorophyll content (Fig. 5B). When comparing photosynthesis rates of six biological replicates for each genotype at light intensities of 100, 150, and 300 μmol m-2 s-1, no statistically significant difference could be observed (P values ranging from 0.6 to 0.9). Similarly, no difference was seen for the same plants in either pigment content (total chlorophyll for WT = 23.18 μg cm-2 = 258.28 μmol m-2, KO = 23.04 μg cm-2 = 256.68 μmol m-2; P = 0.83) or chlorophyll a to b ratio (WT = 2.276, KO = 2.255; P = 0.78). Discussion The evolutionary origin of MFP1 coincides with a terrestrial life style Chloroplast proteins fall into two categories based on their evolutionary origin: one represented by proteins of prokaryotic origin that were present in the ancestor of modern chloroplasts, and the other group consisting of proteins of eukaryotic origin that were introduced from the host cell during chloroplast evolution. The Eastern Biologist A.R. Havighorst and A. Rose 2018 No. 6 14 long coiled-coil domain and results from database searches suggest that MFP1 falls into the latter category and is a protein of eukaryotic origin. Prediction of chloroplast and thylakoid targeting signals as well as transmembrane and coiled-coil domains revealed that the domain structure of MFP1 is well conserved throughout the seed plants (Fig. 1). The N-terminus in seedless plants is less well conserved, but usually contains a putative chloroplast targeting signal and a hydrophobic domain. All MFP1-like proteins share the long coiled-coil domain, with more distantly related sequences showing significant local similarity in the C-terminal half of the coiled-coil domain implicated in DNA binding. Identifying more distantly related sequences to MFP1 presented a challenge due to the long coiled-coil domain of the protein. The repetitive nature of coiledcoil sequences often results in unrelated sequence similarities due to structural constraints that do not indicate homology (Rose et al. 2004). Therefore, consecutive and reverse searches were performed to confirm MFP1-like sequences and distinguish them from random matches to unrelated long coiled-coil sequences. Gene predictions were used to predict full-length mRNA and peptide sequences where such information was not yet available in the database. It is likely that these predictions will have to be adjusted as more expressed sequence information becomes available. For example, two different versions of the S. moellendorffii MFP1-like sequence were predicted depending on the splice site model used, and combined 5′ and 3′ ESTs in this case covered only the coiled-coil domain. This Figure 5. Photosynthesis rates and chlorophyll content are unaffected by lack of MFP1. (A) Light response curves for photosynthesis rates were measured as net CO2 uptake dependent on photosynthetic photon flux density (PPFD) in two-week old pla nts. WT, wild-type indicated in blue with open circles; KO, knock-out mutant measurements in green with cross marks. Each curve represents the average of three biological replicates. (B) Chlorophyll a and b content was measured using DMF extraction and spectrophotometry. WT, wild-type in yellow; KO, knock-out mutant in green. Each bar represents the average and standard deviation for six biological replicates. Statistical analysis (T-test) indicated no difference Eastern Biologist A.R. Havighorst and A. Rose 2018 No. 6 15 suggests that alternative splicing might occur, with the coiled-coil domain being more commonly expressed, or that the gene prediction is not entirely accurate. For the P. patens sequence, gene prediction failed to identify exons corresponding to the N-terminus of the protein in other plants and only the coiled-coil domain could be predicted. A search with the moss (P. patens) sequence with stringent E-value cutoffs succeeded in identifying MFP1 from higher plants, indicating that MFP1 is present in all phyla of embryophytes including bryophytes and may represent a novel protein sequence adaptive to plants moving onto land around 475 million years ago. A tblastn search with the moss sequence on whole genome shotgun contigs identified a short peptide match translated from genomic DNA of the charophyte alga K. flaccidum with an E-value of 0.001 close to the E-values found for clearly unrelated sequences. Additional database searches and pairwise sequence alignments provided evidence that this sequence represents an MFP1-like algal protein and not a random match, supported by almost 30% identity to the moss sequence in pairwise alignments (Table 2). Furthermore, gene prediction on the K. flaccidum genomic sequence surrounding the match revealed a putative gene coding for a protein strongly resembling the domain structure of MFP1 (Fig. 1), again supporting the notion that this sequence may indeed represent a distant MFP1-like homolog. The identification of a putative MFP1-like precursor in the alga K. flaccidum has intriguing implications for the evolutionary origin of MFP1 and may provide a clue to its function. K. flaccidum belongs to the charophytes, the group of green algae most closely related to plants, and has a terrestrial growth habit. Recent analysis of its genome revealed that it acquired many genes specific to land plants, including ABA signaling to deal with drought stress and a primitive system for cyclic electron flow to protect against high light intensity (Hori et al. 2014). No sequences with significant similarities to this putative algal MFP1-like protein could be identified from other algae, such as Chlamydomonas, or cyanobacteria, therefore it appears to represent a novel protein in the streptophyte lineage. The presence of a putative MFP1-ancestor sequence in K. flaccidum, but not other fully sequenced algae genomes, proposes that the acquisition of this early form of MFP1 coincided with the transition from an aquatic to a terrestrial life style and suggests an adaptive function for the presence of a membrane-bound coiled-coil protein in chloroplasts for growth on land. Subsequently, this early MFP1-like protein appears to have undergone stabilizing selection for a TAT pathway thylakoid targeting signal during the transition from seedless vascular plants to seed plants. MFP1 does not play a role in thylakoid stacking or photosynthesis One characteristic of the thylakoids of charophyte algae and land plants is the formation of tightly appressed grana stacks. Our initial hypothesis for the function of MFP1 was that it might be involved either in forming or maintaining the structure of the grana stacks, based on the protein’s structural similarity to that of the golgins, which maintain the stacks in the Golgi apparatus (Rose et al. 2004). The Eastern Biologist A.R. Havighorst and A. Rose 2018 No. 6 16 results obtained here, however, do not support this hypothesis. TEM micrographs of the thylakoid membranes in MFP1 knock-out plants show no deficiency in thylakoid stacking in comparison with wild-type plants grown under the same conditions (Fig. 3). Slight differences in the number of grana stacks and grana layers can probably be attributed simply to the natural dynamics of the membrane system within the chloroplast. It is possible that MFP1 acts only under specific conditions, such as in remodeling of the thylakoids during state transitions, which may involve membrane fission and fusion events (Chuartzman et al. 2008). Interestingly, maize MFP1 was found to be two-fold enriched in bundle sheath cells over mesophyll cells (Majeran et al. 2008, Friso et al. 2010), suggesting it may play a role in or be affected by thylakoid changes associated with C4 photosynthesis. Knock-out mutants lacking MFP1 protein appear indistinguishable from wild-type under standard growth conditions, but we found delayed bolting under short-day photoperiod (Fig. 2). A. thaliana MFP1 appears to be a target for the transcription factor PIL5 that mediates gene regulation through phytochrome during seed germination and regulates genes involved in hormone signaling (Oh et al. 2009). In addition to a possible link with phytochrome response and photoperiod, recent evidence suggests that stress can affect MFP1 expression. In cotton, MFP1 mRNA expression was found to be up-regulated in plants grown under various stress conditions including ABA, cold, drought, high salinity and pH (Zhu et al. 2013). However, no significant difference in expression could be observed in A. thaliana within 24 hours of such stress treatments (Killian et al. 2007), suggesting that MFP1 expression changes as part of a slow, long-term adaptive response. These pathways are of particular importance to land plants, matching well with a possible adaptive role for MFP1 during the transition from water to land. If MFP1 was involved in adaptation to stress or different light conditions, its lack could be causing subtle changes and a delay in development that are not detectable under normal growth conditions. Thus, further insight might be gained by observing chloroplast and thylakoid ultrastructure as well as photosynthetic performance in plants grown under different light and stress conditions. MFP1 is a member of multiple chloroplast protein complexes The results of the BN-PAGE experiments support the idea that MFP1 is involved in protein complex formation and homeostasis in chloroplasts. Two strong signals stand out when detecting MFP1 in immunoblots of 1D BN gels: A wide band in the range of about 150–500 kDa, and a well-defined band in the megadalton range surrounded by more diffuse signal spread nearly to the start of the running gel. No signal was observed between the lower molecular weight complexes (~150–500 kDa) and these higher molecular weight complexes (>880 kDa), suggesting that MFP1 is part of multiple distinct protein complexes in the chloroplast (Fig. 4A, Western). The presence of MFP1 in several high molecular mass complexes is also corroborated by chloroplast membrane proteomics studies in maize, which identified MFP1 homologs in complexes of ~250, 500, and 700 kDa (Majeran et al. 2008). These Eastern Biologist A.R. Havighorst and A. Rose 2018 No. 6 17 MFP1-containing complexes likely represent thylakoid-associated complexes, based on the known integral thylakoid membrane localization of MFP1 and a clear lack of MFP1 observed in stroma protein complexes (Friso et al. 2004, Jeong et al. 2003, Olinares et al. 2010). Full-length A. thaliana MFP1 has a predicted size of 82 kDa, and processed, mature plastidic MFP1 with the targeting peptides cleaved off is predicted to be 72 kDa in size. However, no signal was detected below 150–160 kDa, suggesting that MFP1 does not exist as a monomer in the chloroplast, but is always found within a complex or as a homodimer (Fig. 4A). Dimerization of MFP1 has also been previously reported from SDS-PAGE results, which indicated the presence of MFP1 homodimer in onion nuclear matrix fractions (Samaniego et al. 2008). The 2D BN/SDS-PAGE showed a variety of partial MFP1 sizes around 50–55 kDa and smaller in addition to the mature protein, which may indicate alternative splice forms, modification, or cleavage of MFP1 within the complex it is forming. The MFP1 signal detected in higher molecular mass complexes above the 880 kDa marker size is markedly concentrated in a strong band in the megadalton range. This signal may represent the A. thaliana transcription complex (1500–1700 kDa, Behrens et al. 2013), based on MFP1’s known association with the nucleoid. Lack of MFP1 affects relative abundance of chloroplast protein complexes Due to MFP1’s location in the thylakoid membrane, we tested whether the protein may be involved in organizing photosynthetic complexes of the thylakoid membrane. No difference could be detected between mutant and wild-type plants grown under standard laboratory conditions in either photosynthesis rates or chlorophyll content (Fig. 5). However, changes in the relative abundance of several complexes in the MFP1 knock-out mutant compared to wild-type suggest that MFP1 may be indirectly involved in the formation or maintenance of chloroplast protein complexes (Fig. 4A). To identify the nature of these protein complexes, the apparent size and relative positions of the bands were compared with previously published BN-PAGE data obtained after solubilization of chloroplasts or thylakoids with digitonin (Heinemeyer et al. 2004, Järvi et al. 2011). The results suggest that lack of MFP1 reduces the relative abundance of complexes in the size range for PSII monomers, LHCII assembly, cytochrome b6f and F1 ATP synthase. On the other hand, a band in the range of PSI-LHCII complexes or PSII supercomplexes appears stronger in the mutant. PSI-LHCII complexes are only observed after digitonin-solubilization and not with other detergents (Järvi et al. 2011). Since the abundance of these complexes appears to change between wild-type and mutant, MFP1 might facilitate some aspect of the dynamics of the system by affecting protein complex formation or stability. Conclusions MFP1 is an enigmatic integral thylakoid and nucleoid protein found in all fully sequenced plant genomes analyzed to-date. It is especially well conserved in seed Eastern Biologist A.R. Havighorst and A. Rose 2018 No. 6 18 plants, and MFP1-like sequences can also be detected in seedless plants. Sequence similarities and domain structures suggest that MFP1 is likely a membrane-bound long coiled-coil protein of eukaryotic origin that was sequestered into plastids using a chloroplast targeting signal early in the evolution of land plants. Its structure and localization appear unique; no other protein encoded by the A. thaliana genome is similar in sequence or even shares the same domain structure with MFP1 (Jeong et al. 2003). However, knock-out mutants lacking MFP1 are phenotypically indistinguishable from wild-type under standard growth conditions, which is surprising as one would expect to find a well conserved function for such a unique and evolutionarily ancient protein. It has previously been shown that despite its association with the chloroplast genome, MFP1 does not appear to be essential in anchoring the nucleoid to the thylakoid membrane (Jeong et al. 2003). This study has demonstrated that MFP1 also does not appear to be involved in thylakoid membrane stacking or photosynthesis, but instead associates with multiple chloroplast protein complexes. Furthermore, lack of MPF1 affects the relative abundance of complexes in the size range of prominent thylakoid complexes. Identification of the protein interaction partners of MFP1 in the chloroplast should provide further insight into its function. Acknowledgements We are very grateful to Dr. Iris Meier (The Ohio State University) for generously sharing seeds and antibodies used in this study, and would like to thank Dr. Guichuan Hou (CAS Microscopy Center, Appalachian State University) for instruction and user time on the transmission electron microscope, Dr. Howard Neufeld (Appalachian State University) for sharing the LI-COR photosynthesis system, and Alyssa Teat for valuable help in conducting the measurements and analyzing the data. This study was supported with funds from the Department of Biology, College of Arts and Sciences, and the Office of Student Research at Appalachian State University. Literature Cited Barr, F.A., and B. Short. 2003. Golgins in the structure and dynamics of the Golgi apparatus. Current Opinion in Cell Biology 15:405–413. Barsan, C., M. Zouine, E. Maza, W. Bian, I. Egea, M. Rossignol, D. Bouyssie, C. Pichereaux, E. Purgatto, M. Bouzayen, A. Latché, and J.C. Pech. 2012. Proteomic analysis of chloroplast-to-chromoplast transition in tomato reveals metabolic shifts coupled with disrupted thylakoid biogenesis machinery and elevated energy-production components. Plant Physiology 160:708–725. Behrens, C., C. Blume, M. Senkler, H. Eubel, C. Peterhänsel, and H.P. Braun. 2013. The “protein complex proteome” of chloroplasts in Arabidopsis thaliana. Journal of Proteomics 91:73–83. Bendtsen, J. D., H. Nielsen, D. Widdick, T. Palmer, and S. Brunak. 2005. Prediction of twinarginine signal peptides. BMC Bioinformatics 6:167. Chow, W.S., E.H. Kim, P. Horton, and J.M. Anderson. 2005. Granal stacking of thylakoid membranes in higher plant chloroplasts: The physicochemical forces at work and the Eastern Biologist A.R. Havighorst and A. Rose 2018 No. 6 19 functional consequences that ensue. Photochemical and Photobiological Sciences 4:1081–1090. Chuartzman, S. G., R. Nevo, E. Shimoni, D. Charuvi, V. Kiss, I. Ohad, V. Brumfeld, and Z. Reich. 2008. Thylakoid membrane remodeling during state transitions in Arabidopsis. Plant Cell 20:1029–1039. Cui, Y. L., Q.S. Jia, Q.Q. Yin, G.N. Lin, M.M. Kong, and Z.N. Yang. 2011. The GDC1 gene encodes a novel ankyrin domain-containing protein that is essential for grana formation in Arabidopsis. Plant Physiology 155:130–141.13 Emanuelsson, O., S. Brunak, G. von Heijne, and H. Nielsen. 2007. Locating proteins in the cell using TargetP, SignalP, and related tools. Nature Protocols 2:953–971. Emanuelsson, O., H. Nielsen, and G. von Heijne. 1999. ChloroP, a neural network-based method for predicting chloroplast transit peptides and their cleavage sites. Protein Science 8:978–984. Friso, G., L. Giacomelli, A.J. Ytterberg, J.B. Peltier, A. Rudella, Q. Sun, and K.J. van Wijk. 2004. In-depth analysis of the thylakoid membrane proteome of Arabidopsis thaliana chloroplasts: New proteins, new functions, and a plastid proteome database. Plant Cell 16:478–499. Friso, G., W. Majeran, M. Huang, Q. Sun, and K.J. van Wijk. 2010. Reconstruction of metabolic pathways, protein expression, and homeostasis machineries across maize bundle sheath and mesophyll chloroplasts: Large-scale quantitative proteomics using the first maize genome assembly. Plant Physiology 152:1219–50. Fristedt, R., P. Granath, and A.V. Vener. 2010. A protein phosphorylation threshold for functional stacking of plant photosynthetic membranes. PLoS ONE 5(6):e10963. Gindullis, F., and I. Meier. 1999. Matrix attachment region binding protein MFP1 is localized in discrete domains at the nuclear envelope. Plant Cell 11:1117–1128. Harder, P.A., R.A. Silverstein, and I. Meier. 2000. Conservation of matrix attachment region-binding filament-like protein 1 among higher plants. Plant Physiology 122:225–234. Heinemeyer, J., H. Eubel, D. Wehmhöner, L. Jänsch, and H.P. Braun. 2004. Proteomic approach to characterize the supramolecular organization of photosystems in higher plants. Phytochemistry 65:1683–1692. Hori, K., F. Maruyama, T. Fujisawa, T. Togashi, N. Yamamoto, M. Seo, S. Sato, T. Yamada, H. Mori, N. Tajima, T. Moriyama, M. Ikeuchi, M. Watanabe, H. Wada, K. Kobayashi, M. Saito, T. Masuda, Y. Sasaki-Sekimoto, K. Mashiguchi, K. Awai, M. Shimojima, S. Masuda, M. Iwai, T. Nobusawa, T. Narise, S. Kondo, H. Saito, R. Sato, M. Murakawa, Y. Ihara, Y. Oshima-Yamada, K. Ohtaka, M. Satoh, K. Sonobe, M. Ishii, R. Ohtani, M. Kanamori-Sato, R. Honoki, D. Miyazaki, H. Mochizuki, J. Umetsu, K. Higashi, D. Shibata, Y. Kamiya, N. Sato, Y. Nakamura, S. Tabata, S. Ida, K. Kurokawa, and H. Ohta. 2014. Klebsormidium flaccidum genome reveals primary factors for plant terrestrial adaptation. Nature Communications 5:3978. Järvi, S., M. Suorsa, V. Paakkarinen, and E.M. Aro. 2011. Optimized native gel systems for separation of thylakoid protein complexes: Novel super- and mega-complexes. Biochemical Journal 439:207–214. Jeong, S.Y., N. Peffer, and I. Meier. 2004. Phosphorylation by protein kinase CKII modulates the DNA-binding activity of a chloroplast nucleoid-associated protein. Planta 219:298–302. Jeong, S.Y., A. Rose, and I. Meier. 2003. MFP1 is a thylakoid-associated, nucleoid-binding protein with a coiled-coil structure. Nucleic Acids Research 17:5175–5185. Eastern Biologist A.R. Havighorst and A. Rose 2018 No. 6 20 Kikuchi, S., J. Bédard, and M. Nakai. 2011. One- and two-dimensional blue native-PAGE and immunodetection of low-abundance chloroplast membrane protein complexes. Methods in Molecular Biology 775:3–17.14 Killian, J., D. Whitehead, J. Horak, D. Wanke, S. Weinl, O. Batistic, C. D’Angelo, E. Bornberg-Bauer, J. Kudla, and K. Harter. 2007. The AtGenExpress global stress expression data set: Protocols, evaluation and model data analysis of UV-B light, drought and cold stress responses. Plant Journal 50:347–363. Kim, E.H., W.S. Chow, P. Horton, and J.M. Anderson. 2005. Entropy-assisted stacking of thylakoid membranes. Biochimica et Biophysica Acta 1708:187–195. Krause, K., S. Oetke, and K. Krupinska. 2012. Dual targeting and retrograde translocation: Regulators of plant nuclear gene expression can be sequestered by plastids. International Journal of Molecular Sciences 13:11085–11101. Kügler, M., L. Jansch, V. Kruft, U.K. Schmitz, and H.P. Braun. 1997. Analysis of the chloroplast protein complexes by blue-native polyacrylamide gel electrophoresis (BN-PAGE). Photosynthesis Research 53:35–44. Majeran, W., G. Friso, Y. Asakura, X. Qu, M. Huang, L. Ponnala, K.P. Watkins, A. Barkan, and K.J. van Wijk. 2012. Nucleoid-enriched proteomes in developing plastids and chloroplasts from maize leaves: A new conceptual framework for nucleoid functions. Plant Physiology 158:156–189. Majeran, W., B. Zybailov, A.J. Ytterberg, J. Dunsmore, Q. Sun, and K.J. van Wijk. 2008. Consequences of C4 differentiation for chloroplast membrane proteomes in maize mesophyll and bundle sheath cells. Molecular and Cellular Proteomics 7:1609–38. Meier, I., T. Phelan, W. Gruissem, A. Spiker, and D. Schneider. 1996. MFP1, a novel plant filament-like protein with affinity for matrix attachment region DNA. Plant Cell 8:2105–2115. Melonek, J., A. Matros, M. Trösch, H.P. Mock, and K. Krupinska. 2012. The core of chloroplast nucleoids contains architectural SWIB domain proteins. Plant Cell 24:3060–3073. Mullineaux, C. W. 2005. Function and evolution of grana. Trends in Plant Science 10:521–525. Nakai, K., and P. Horton. 1999. PSORT: A program for detecting sorting signals in proteins and predicting their subcellular localization. Trends in Biochemical Sciences 24:34–36. Oh, E., H. Kang, S. Yamaguchi, J. Park, D. Lee, Y. Kamiya, and G. Choi. 2009. Genomewide analysis of genes targeted by PHYTOCHROME INTERACTING FACTOR 3-LIKE5 during seed germination in Arabidopsis. Plant Cell 21:403–419. Olinares, P.D.B., L. Ponnala, and K.J. van Wijk. 2010. Megadalton complexes in the chloroplast stroma of Arabidopsis thaliana characterized by size exclusion chromatography, mass spectrometry, and hierarchical clustering. Mol. Cell. Proteomics 9:1594–1615. Peltier, J.B., A.J. Ytterberg, Q. Sun, and K.J. van Wijk. 2004. New functions of the thylakoid membrane proteome of Arabidopsis thaliana revealed by a simple, fast, and versatile fractionation strategy. Journal of Biological Chemistry 279:49367–49383. Pfeiffer, S., and K. Krupinska. 2005. New insights in thylakoid membrane organization. Plant Cell Physiology 46:1443–1451. Porra, R.J., W.A. Thompson, and P.E. Kriedeman. 1989. Determination of accurate extinction coefficients and simultaneous equations for assaying chlorophylls a and b extracted with four different solvents: Verification of the concentration of chlorophyll standards by atomic absorption spectroscopy. Biochimica et Biophysica Acta 975:384–394. Reynold, E.S. 1963. The use of lead citrate at high pH as an electron-opaque stain in electron microscopy. Journal of Cell Biology 17:208–213.15 Eastern Biologist A.R. Havighorst and A. Rose 2018 No. 6 21 Rose, A., S. Manikantan, S.J. Schraegle, M.A. Maloy, E.A. Stahlberg, and I. Meier. 2004. Genome-wide identification of Arabidopsis coiled-coil proteins and establishment of the ARABI-COIL database. Plant Physiology 134:927–939. Rose, A., and I. Meier. 2004. Scaffolds, levers, rods and springs: Diverse cellular functions of long coiled-coil proteins. Cellular and Molecular Life Sciences 61:1996–2009. Rose, A., S.J. Schraegle, E.A. Stahlberg, and I. Meier. 2005. Coiled-coil protein composition of 22 proteomes – differences and common themes in subcellular infrastructure and traffic control. BMC Evolutionary Biology 5:66. Sambrook, J., E. Fritsch, and T. Maniatis. 1989. Molecular Cloning: A Laboratory Manual. New York: Cold Spring Harbor Press. Samaniego, R., C. de la Torre, and S. Moreno Díaz de la Espina. 2008. Characterization, expression and subcellular distribution of a novel MFP1 (matrix attachment regionbinding filament-like protein 1) in onion. Protoplasma 233:31–38 . Samaniego, R., S.Y. Jeong, I. Meier, and S. Moreno Díaz de la Espina. 2006a. Dual location of MAR-binding, filament-like protein 1 in Arabidopsis, tobacco, and tomato. Planta 223:1201–1206. Samaniego, R., S.Y. Jeong C. de la Torre, I. Meier, and S. Moreno Díaz de la Espina. 2006b. CK2 phosphorylation weakens 90 kDa MFP1 association to the nuclear matrix in Allium cepa. Journal of Experimental Botany 57:113–124. Short, B., A. Haas, and F.A. Barr. (2005). Golgins and GTPases, giving identity and structure to the Golgi apparatus. Biochimica et Biophysica Acta 1744:383–395. Smith, T.F., and M.S. Waterman. 1981. Identification of common molecular subsequences. Journal of Molecular Biology 147:195–197. Sonnhammer, E.L., G. von Heijne, and A. Krogh. 1998. A hidden Markov model for predicting transmembrane helices in protein sequences. Proceedings of the International Conference on Intelligent Systems for Molecular Biology 6:175–182. Tardif, M., A. Atteia, M. Specht, G. Cogne, N. Rolland, S. Brugière, M. Hippler, M. Ferro, C. Bruley, G. Peltier, O. Vallon, and L. Cournac. 2012. PredAlgo: A new subcellular localization prediction tool dedicated to green algae. Molecular Biology and Evolution 29:3625–3639. Varma, V., and A.M. Osuri. 2013. Black Spot: A platform for automated and rapid estimation of leaf area from scanned images. Plant Ecology 214:1529–1534. Wolf, E., P.S. Kim, and B. Berger. 1997. MultiCoil: A program for predicting two- and three-stranded coiled coils. Protein Science 6:1179–1189. Zhu, Y.N., D.Q. Shi, M.B. Ruan, L.L. Zhang, Z.H. Meng, J. Liu, and W.C. Yang. 2013. Transcriptome analysis reveals crosstalk of responsive genes to multiple abiotic stresses in cotton (Gossypium hirsutum L.). PLoS ONE 8(11):e8021.